Cash value for farmers is $82 million annually and economic impact exceeds $115 million in the state. 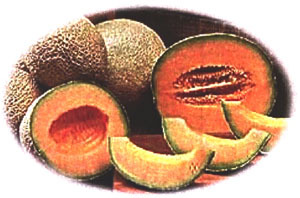 Melons include cantaloupes (75%), honeydews (20%), and other related melons. Most melons are direct seeded but 5 to 10% of acreage is transplanted for earlier marketing. There are 12,000 to 20,000 acres grown in Texas, depending on market outlook. Growers prefer hybrid seed because of higher yields and consistent quality. Most melons are produced with plastic mulch and drip irrigation. Some areas use furrow or sprinkler irrigation. Problems include whiteflies, aphids, mites, lepidopteran worms, leafminers, squash bugs, and thrips. All of these insects can cause significant losses that can exceed 50% but can be controlled with insecticides. Aphids and whiteflies also transmit serious viruses. Honeybees are essential for pollination and fruit development. Insecticides that may harm pollinators are often applied in evenings when the bees are not foraging. There are no insect-resistant varieties. Early planting helps reduce some losses due to late-season insects. Some varieties resist viruses transmitted by aphids and other insects. Diazinon, oxamyl (Vydate), and dimethoate (Cygon) are three FQPA-targeted products that, if withdrawn, could negatively impact the industry by 10% in yield. Currently there are no commercial replacements for diazinon. An alternative for dimethoate could be imidacloprid (Admire, Provado) which is labeled as a Section 3. Oxamyl is used primarily as a nematicide; there are no economical replacements. Problems include fungal leaf spots, Fusarium wilt, downy mildew, powdery mildew, and gummy stem blight, and others. Some melon varieties resist several pathogens such as fusarium wilt and powdery mildew. Some varieties tolerate sulfur, which can be used to control powdery mildew. No biological control agents are available. Chlorothalonil (Bravo)and dithiocarbamates (Maneb and others) are two FQPA targeted products that could negatively impact the industry by 50% in yield if withdrawn. These two products control a broad spectrum of fungal diseases. There are no commercial replacements for these products but azoxystrobin (Quadris) is labeled as a section 3 and myclobutanil (Nova) is labeled as an emergency use/Section 18. These fungicides are effective against certain pathogens and are not broad spectrum. Pigweed, purslane, sunflower, and others reduce crop growth by robbing water and shade from the crop. Texas panicum, johnsongrass, and yellow nutsedge are highly competitive with melons for water and shade. Cultivation is practiced while the plants are young but once vines become one foot or longer, tillage is no longer possible. Fields are rotated to reduce pest problems. Bensulide (Prefar) is an FQPA targeted product that if withdrawn could negatively impact the industry by as much as 20% reduction in yields. Two partial replacements are trifluralin (Treflan) and naptalam (Alanap) but can cause some phytotoxicity. Halosulfuron (Permit) is being assessed for postemergence weed control. Field scouts monitor pest problems and give spray advisories as needed. Breeding continues to provide improved cultivars, including potential for GMO lines. For latest information regarding these issues and status of risk assessments contact j-anciso@tamu.edu or visit ipmwww.ncsu.edu/opmppiap and www.epa.gov/pesticides. Crop Briefs is an information series developed by Texas A&M AgriLife of the Texas A&M University System on critical pest problems and pesticide needs for Texas agriculture. This effort is supported by the Texas Vegetable Association, and other commodity groups. Dr. Dudley Smith, Texas Agricultural Experiment Station and Dr. Juan Anciso, Texas AgriLife Extension Service prepared these reports August 2000 using information from numerous sources. Departmental Report SCS-2000-01.The information given herein is for educational programs only. Reference to commercial products or trade names is made with the understanding no discrimination is intended and no endorsement by the Texas AgriLife Extension Service and the Texas Agricultural Experiment Station is implied.